Hi Brandi...I will be back here on the 17th to see Luci's new look for Easter! how are u? I love looking at all the avvi's in here...amazing! Hey Leroy! Good to see you! Happy St. Patrick's Day and post more, I miss you! Don't have to wait long now. I'll be posting them all this evening! Good to see you, I have been fine, thanks! Hope everyone had/is having a great Saint Patrick's Day! 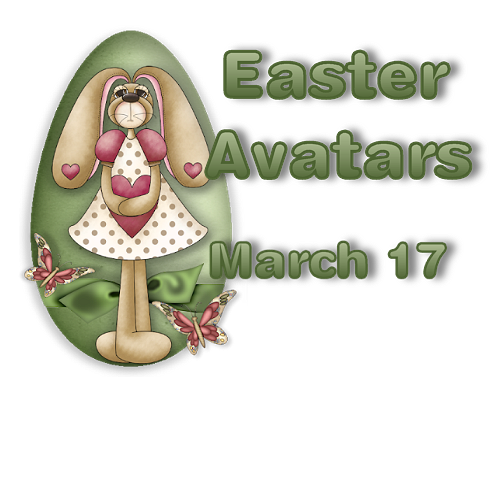 I am posting Easter avatars tonight, since Easter is just two and a half weeks away! As always, if yours is not posted and you'd like me to decorate your avatar, just leave me a post. If you have any suggestions for your avatar, let me know. If you'd like a spring avatar to change into after Easter, let me know when you pick up your Easter avatar and I'll have it ready for you on Easter! A refresher on changing your avatar: Click on Profile at the top of this page, then go to "Forum Profile Information" on the left ... then under Picture, click the THIRD radio button: "I will upload my own picture" option. DELETE the "http://" in the box, then add your URL. Then scroll down to the bottom and click the "Change profile" button. And, voila! Your avatar is updated. If you need help changing it, just let me know. Hi Brandi! Looks like you have a busy day ahead. I just want to stop by & wish you a very Happy St. Patty's Day. I remembered the forgetmenot flowers! It's so nice out today, I decided to go for a walk. Hope you like one of them! Got you back in your old clothes again! Luci is all dressed up in her Easter finery! Buddy is read for Easter! Page created in 2.849 seconds with 19 queries.